For onigiri you'll want to purchase sticky sushi rice. Traditionally white rice is used, but brown rice can be used as well. I have fallen in love with the Mishima Yukari shiso rice seasoning which I purchased in Japan. It does contain MSG, so if you avoid that seasoning try this dried shiso leaf from Eden foods. Or you can skip it all together and add a tad more salt to your rice as it cooks. Buy these products online or find them at a local Japanese grocery store. If you live in NYC check out Dainobu. Bring your rice, yam, and squash, salt, and water to a simmer. Place a lid on the pot, keeping it slightly ajar, and cook for 15 minutes. Remove the rice from the heat, and cover completely with the lid. Allow to steam for 10 minutes. Stir the black sesame seeds into the rice, and allow it to cool for 5-10 minutes longer. Dampen your hands, scoop out 1 cup of rice, and shape it into your desired onigiri shape. You'll have to work quickly because the rice is hot. Alternatively you can put the rice in a sheet of plastic wrap, tighten the wrap, and shape the rice. 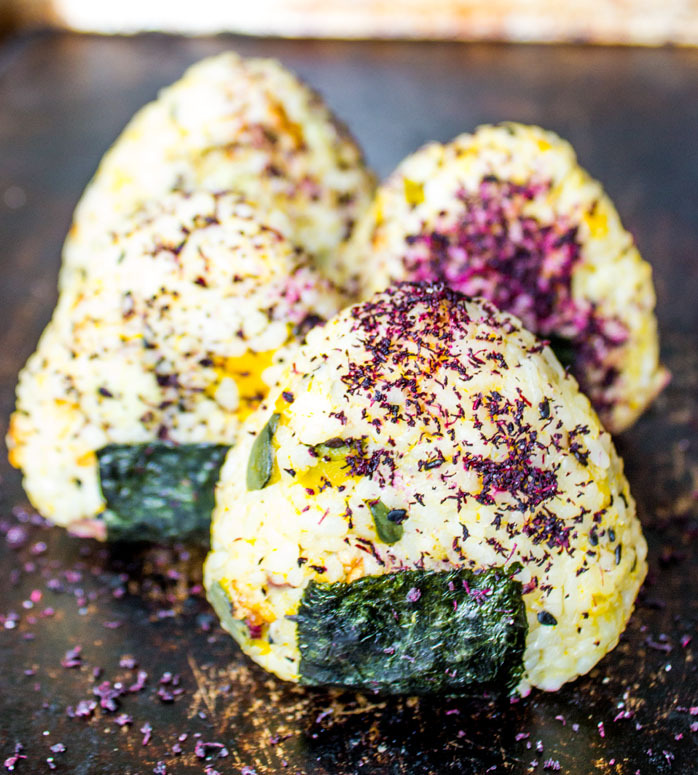 After shaping each rice ball wrap it in a sheet of nori, and sprinkle some shiso leaf seasoning over it. Complete with the remaining rice. Onigiri will stay fresh for 2-3 days in the refrigerator. Allow to sit out at room temperature before eating left overs, because the rice is hard when it comes right out of the refrigerator.